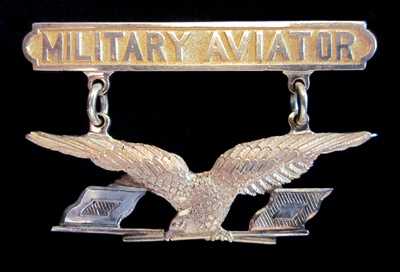 1913 Military Aviator gold proof-badge #1 given to Captain Charles DeForest Chandler, Chief of the Aeronautical Division, Signal Corps, from 1 August 1907 to 30 June 1910, and 20 June 1911 to 9 September 1913. The die for this badge was manufactured by the Ordnance Department at the Rock Island Arsenal, Illinois. It was struck in 14k gold, and then coated with 24k gold before receiving additional hand embellishments by a skilled engraver. It was then forwarded to Brigadier General George P. Scriven, Chief Signal Officer, Washington, DC, for his approval. After being approved by General Scriven the badge was given to Captain Chandler on 6 October 1913. USMC - KIA 10/04/44 PFC Weiland's canteen found on Peleliu and returned to our family by Randy VanDyken on April 4th, 2008 - almost 64 years after it was last used by George. Click here for more about the canteen and its amazing journey home. This site is also dedicated to the memory of J. Duncan Campbell, Don Chalif and Warren Carroll. Men who helped pioneer the hobby of wing collecting. Their books can be found in the Resources section of the site and are great references for any collector. I am honored to have known all of them. I created the site for veterans, enthusiasts or anyone else interested in aviation insignia of World War II. The goal is to create a collection of images of as many different patterns, sizes and makes of the wings worn by these valiant people. In the resources section you will find some excellent guides to wings and wing collecting. I'm hoping to add to those sources by displaying as many wings as possible on this site. I'm not an expert on wings by any means so please feel free to dispute the authenticity of any item on the site. I do my best to only show period pieces. If you have any images from your collection you would like to add to any category please e-mail me. Please help me make this a resource all wings fans can share. Please remember, I would like to display only period wings so please - no restrikes!